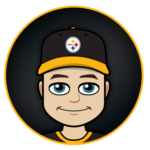 MyBookie's NFL betting line has the Steelers -3.0, with a 46.5 over/under. 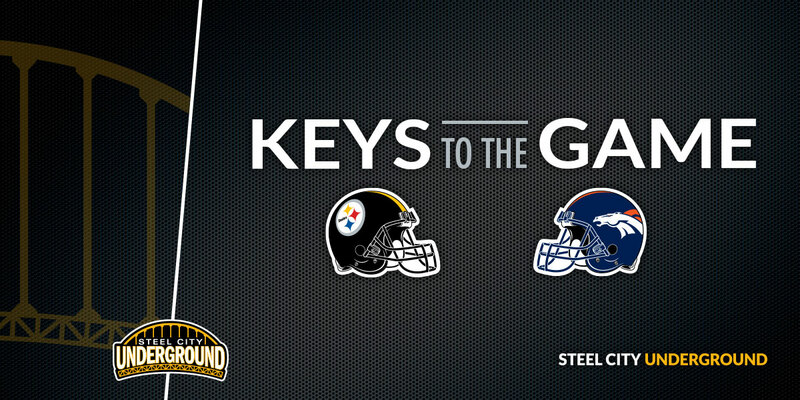 This week’s game will mark the 24th regular-season meeting between Pittsburgh and Denver... the Broncos own a 6.5-game advantage in the regular-season series against the Steelers (14-8-1)... Sunday's game will be the 13th time the two teams will meet in Denver... the Steelers won the last November game against the Broncos in the series, 28-10, on Nov. 9, 2009 on the road. 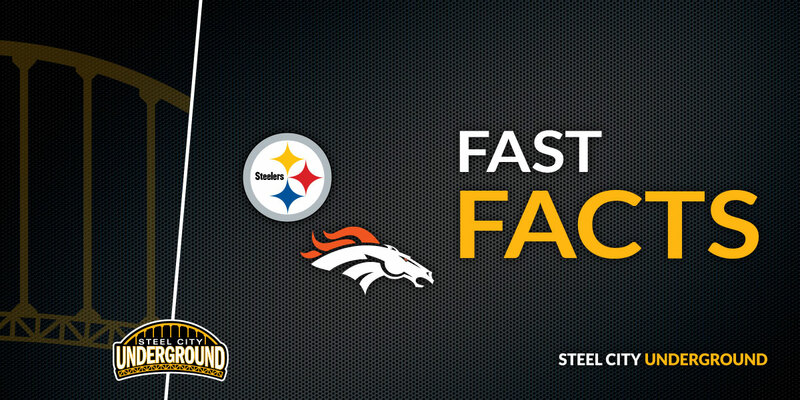 Site: Mile High Stadium (76,125) • Denver, Colo.
QB BEN ROETHLISBERGER passed for 314 yards with 2 TDs & rushed for GW 1-yard TD with 5 seconds remaining in 4th Q last week. Has 1,169 pass yards (292.3 per game) with 11 TDs vs. 4 INTs for 100.7 rating & 2 rush TDs in his past 4. In last meeting, completed 40 of 55 (72.7 pct.) for 380 yards with 3 TDs vs. 2 INTs for 94.5 rating. Has 3+ TD passes in 3 of his past 4 vs. Den. Has 300+ pass yards in 4 of his past 5 vs. AFC West. Ranks 3rd in NFL with 271 completions. RB JAMES CONNER has 8 TDs (7 rush, 1 rec.) in his past 6. In 5 road games this season, has 628 scrimmage yards (125.6 per game) & 5 TDs (4 rush, 1 rec.). Is 1 of 4 NFL players with 1,200+ scrimmage yards (1,207) & 10+ TDs (11) in 2018. Has 4 games with 100+ rush yards & 2+ rush TDs this season & is only NFL player with multiple such games. WR ANTONIO BROWN had team-high 117 rec. yards & TD catch last week. Has 10 TD catches in his past 8. Aims for his 9th in row with rec. TD. Had 16 catches for 189 yards & 2 TDs in last meeting. Has 263 rec. yards (131.5 per game) in 2 career games vs. Den. Leads NFL with 11 TD catches. WR JU JU SMITH-SCHUSTER had 8 catches for 104 yards in Week 11. Since entering league in 2017, ranks 6th in NFL averaging 14.6 yards per catch (min.100 receptions). LB T.J. WATT had 2 sacks & 2 FFs last week. Has 3 sacks & 3 FFs in his past 2. Is 1 of 3 in NFL (VON MILLER & J.J. WATT) with 10+ sacks (10) & 4+ FFs (4). LB VINCE WILLIAMS had 10 tackles & sack in Week 11. QB CASE KEENUM passed for 205 yards in Week 11. Has 612 pass yards (306 per game) with 3 TDs vs. 1 INT for 91 rating in his past 2 at home. Has 2+ TD passes in 2 of his past 3 starts vs. AFC North. Since 2017, is 1 of 8 NFL QBs with 6,000+ pass yards (6,152) & 65+ comp. pct. (65.7). 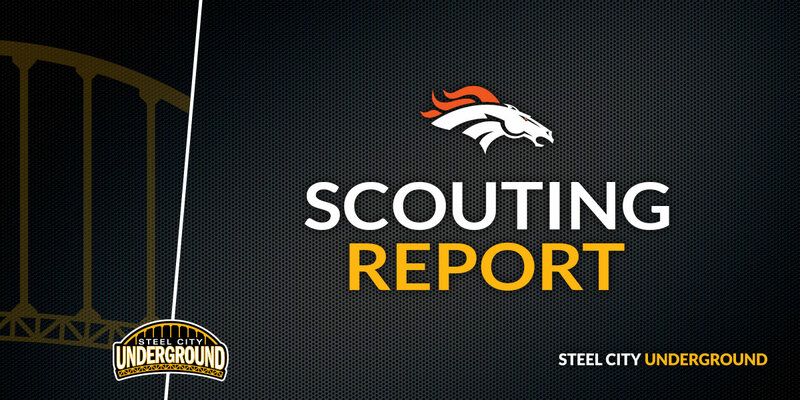 RB PHILLIP LINDSAY (rookie) had 106 scrimmage yards (79 rush, 27 rec.) & 2 rush TDs in Week 11. Aims for his 5th in row with 80+ scrimmage yards. Has 442 scrimmage yards (88.4 per game) & 2 TDs (1 rush, 1 rec.) in 5 career home games. Ranks 2nd among NFL rookies with 670 rush yards & 857 scrimmage yards. Rookie RB ROYCE FREEMAN had rush TD last week. Aims for his 3rd in row with TD & has rush TD in 5 of his past 7. Freeman (5) & Lindsay (5) are only pair of current RB teammates with 5+ rush TDs each this season. WR EMMANUEL SANDERS has 95+ rec. yards in 3 of his past 5 at home. Had 10 catches for 181 yards with TD catch & rushed for 24 yards in last meeting. Spent 4 seasons with Pit. (2010-13), recording 161 catches for 2,030 yards & 11 TDs. Rookie WR COURTLAND SUTTON had team- high 78 rec. yards last week. Has 75+ rec. yards in 2 of his past 3. Is 1 of 5 NFL rookies with 450+ rec. yards (459). LB VON MILLER had sack & INT last week. Aims for his 3rd in row with sack & has 6 sacks in his past 5. Ties for AFC lead with 10 sacks, his 5th consecutive 10+ sack season. CB CHRIS HARRIS, JR. had 8 tackles & INT last week.